ORLANDO, Fla. — As voters go to the polls here, Floridians have a stark choice in their governor’s race where far-left ideologue Andrew Gillum is running against staunch conservative Ron DeSantis. DeSantis, on the other hand, is the former Congressman known for his strong support for President Donald Trump’s policies. DeSantis is running on a conservative platform of across-the-board lower taxes, an end to judicial activism, protection of patients with pre-existing conditions, and strong border policies, including opposition to sanctuary cities and implementation of the E-verify system. DeSantis served in Iraq for the U.S. Navy and received a Bronze Star Medal for Meritorious Service and the Iraq Campaign Medal before becoming the Congressman for Florida’s Sixth District. Gillum started his activism immediately after college by landing a job with the radical, George Soros-financed People for the American Way, or PFAW. He served there first as field organizer in 2002 and then as Director of Youth Leadership Programs from 2005 until January 13, 2017. He departed PFAW just ahead of his gubernatorial run. A Breitbart News investigation found that even while he was a Tallahassee city commissioner and later the city’s mayor, Gillum was heavily involved in the controversial YP4 youth leadership program as youth director, announcing multiple hires and headlining fundraising and group events. During the current gubernatorial race, Gillum has faced controversy over his abject refusal to disavow Dream Defenders, an anti-patriotic, anti-capitalism, anti-military, anti-police organization that has engaged in activist efforts to promote the boycott of Israel and with which Gillum has been associated. DeSantis has repeatedly called for Gillum to distance himself from Dream Defenders. Now it has emerged that Philip Agnew, the co-founder of Dream Defenders, is a 2005 graduate of Gillum’s former YP4 group. Also, at a January 17, 2014 YP4 summit, Gillum’s YP4 gave Agnew the Norman Lear Award, named after the producer and activist who founded People for the American Way. “The fact is, Andrew signed a pledge with the Dream Defenders pledging his support, this radical manifesto,” DeSantis said at the televised debate. “I have no idea what pledge he is talking about,” Gillum replied. 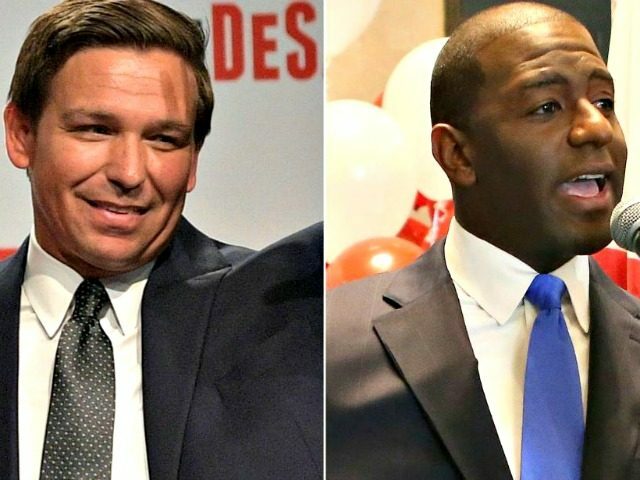 DeSantis warned that if Gillum is victorious then Florida will “become a petri dish for people like George Soros and Tom Steyer,” referring to the activist billionaires. Days before Gillum’s Aug. 28 primary, Soros joined with fellow billionaire Steyer to lead a group of donors making a $650,000 infusion into Gillum’s coffers. Soros contributed to The Collective, a little-known but increasingly influential political organization that says it is seeking to build a “black political power” movement. The Collective reportedly injected nearly $2 million into Gillum’s campaign, funding television and radio ads and get-out-the-vote drives. Gillum recently disclosed a New York hotel invoice made out to Soros’s Open Society Foundations for the same weekend the politician was in the city and obtained a ticket to see the popular “Hamilton” Broadway show in a fiasco involving a corruption probe of the city of Tallahassee, where he serves as mayor, and undercover FBI agents. Breitbart News reported that Gillum graduated from an Oakland, California-based training school for progressive revolutionaries that has spawned a list of activists who have gone on to become the who’s who of the far-left leadership world, with many taking senior positions at organizations financed by Soros.